Rock 95 is giving you yet another bonus chance to win Birthday Bash Passes! 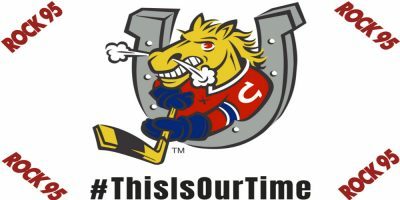 This time it’s at the Barrie Colts Home Opener on Thursday, September 20th VS the Owen Sound Attack! If you’re going to the game, be sure to find the Rock 95 team and fill out a ballot because 2 lucky people will be randomly selected to play “Jumbo Beer Pong” (without the beer) on Center Ice and the winner will be going to the Birthday Bash. And because Rock 95 is the game sponsor there will be a special 50-50 Promo where you can get 95 tickets for only$20.Plus at the Game, you’ll score a Limited Edition Rock 95/Barrie Colt Noise Maker! Win Birthday Bash Passes at the Barrie Colts home opener Thursday night September 20th, as they take on Owen Sound! Puck Drop is at 7:30pm.